You'll sometimes see the words enriched or fortified on processed foods, often with additional health or nutritional claims. Foods that have the words enriched or fortified printed on their labels have had one or more nutrients added to them during the manufacturing process. Common 'added nutrients' include calcium, vitamin C, potassium, iron, protein or fiber. In some ways, enrichment and fortification are similar, but the terms aren't truly interchangeable. You could say that enrichment is a form of fortification, but fortification is not the same as enrichment. The word 'enriched' means nutrients have been added to replace the ones that have disappeared during the manufacturing process. For example, whole wheat is rich in B-complex vitamins and iron that live in the outer parts of the grain, which is called the hull. Whole wheat is nutritious and good for you, but most people prefer to use white flour for their bread, pastries and other baked products. So food manufacturers refine the whole wheat by removing the hulls, creating white flour. Of course, eliminating the hulls also removes most of the B-complex vitamins and iron so they're added back into the flour before packaging and shipping to grocery stores and restaurants. Enrichment is regulated to protect consumers. The United States Food and Drug Administration has rules that food manufacturers must follow to be able to make claims about being enriched. According to the FDA, foods can claim to be enriched if they "contain at least 10 percent more of the Daily Value of that nutrient than food of the same type that is not enriched." Also, products can be labeled as enriched when they meet the "FDA’s definition for a type of food with a name that includes that term (such as enriched bread or enriched rice)." For our example, the flour can only be labeled as "enriched flour" if it contains specified amounts of thiamine, riboflavin, niacin, folic acid, and iron. Fortified foods have extra nutrients added by food manufacturers, but not they're not necessarily meant to replace nutrients that were lost during processing. In fact, fortified foods usually have nutrients that don't occur naturally in the food product. The idea is to make the food healthier by adding additional nutrition. This can be useful for individuals who may be missing out on a few essential ingredients and on a larger scale, food fortification can help provide nutrients that tend to be deficient in the diet and o a lot of good for the population. For example, one of the very first fortified foods in the United States was iodized salt. In the early 1900s, goiter (a disease of the thyroid gland) was relatively common in areas where iodine was deficient in the soil. In 1924, some salt makers added iodine to their product, which helped reduce the number of new cases of goiter dramatically within a short time. 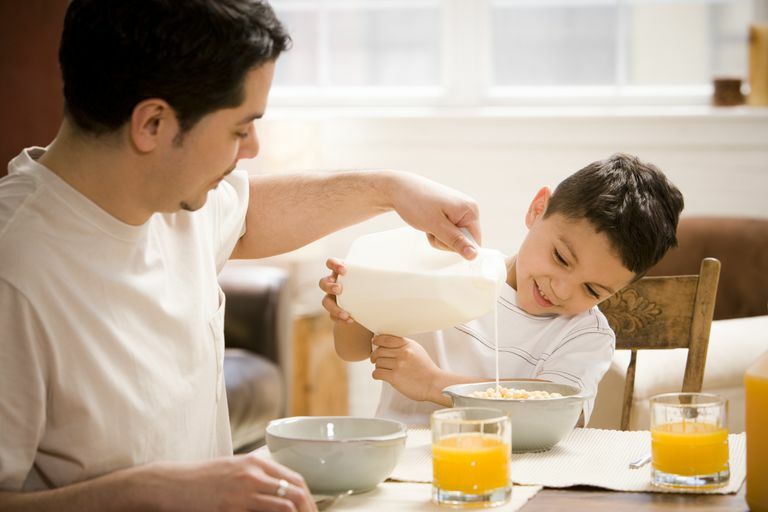 Milk was first fortified with vitamin D in 1933 to ensure that a sufficient amount of calcium would be absorbed. A vitamin D deficiency can lead to rickets in children and osteoporosis in adults. Today you'll find calcium-fortified orange juice, phytosterol-fortified margarine and vitamin and mineral fortified breakfast cereals in your local grocery store. Those are relatively healthy foods, but even junk foods can be fortified with a few extra nutrients so that they can display claims of being fortified or enriched. So be sure to look beyond the claims on the label and examine the Nutrient Facts labels on the back or bottom of the package, because fortification can be an excellent thing, it doesn't automatically turn junk food into healthy food. Bishai D, Nalubola R. "The History of Food Fortification in the United States: Its Relevance for Current Fortification Efforts in Developing Countries." Economic Development and Cultural Change. University of Chicago Press, 2002. The National Academies Press. "Dietary Reference Intakes: Guiding Principles for Nutrition Labeling and Fortification." The United States Food and Drug Administration. "Are Foods That Contain Added Nutrients Considered "Enriched"?"